The kitchen is one of the most popular rooms to remodel, but it's also one of the most expensive. Minor tweaks start at $4,000, but renovations can balloon up to more than $100,000 if they include major structural expansions. The latter figure isn't the norm, though — most people spend around $22,145. You don't need to bring the room down to the studs to make a big change. Having your cabinets repainted by a professional costs about $1,200; having the cabinets refaced cost around between $1,000 to $5,000. If you do nothing else, new countertops can make a huge difference (see costs below). These are a kitchen gamechanger — and to that end, they eat up about 30 percent of the budget. Stock cabinets, like those you can buy off the shelf at home centers, start at $80 to $400 per cabinet. Semi-stock cabinets (IKEA, for example — ones you custom-order from a company's inventory) offer a lot more options and higher quality, and can run from $150 to $1,000 per cabinet. Custom cabinets — made specifically for your space and can often include super-fancy upgrades — cost about $500 to $1,500 each. the large stretches, but save the expensive stuff for the island. at $1 per square foot, or ceramic tile, which will cost you $1.20 per square foot. Things get pricier if you opt for stone (it starts at $1.20 per square foot), and eco-friendly options like cork and bamboo will set you back at least $4 per square foot. Hardwood and engineered flooring also start at $4.25 and $6.00 per square foot, respectively. Once the big pieces are in place, the real style comes in the form of the final touches. Appliances can make a space: Plan to spend between $1,000 and $5,000, depending on your luxury level. Picking a tile back-splash is the fun part of design — and the options are endless (the average back-splash costs $2,485). 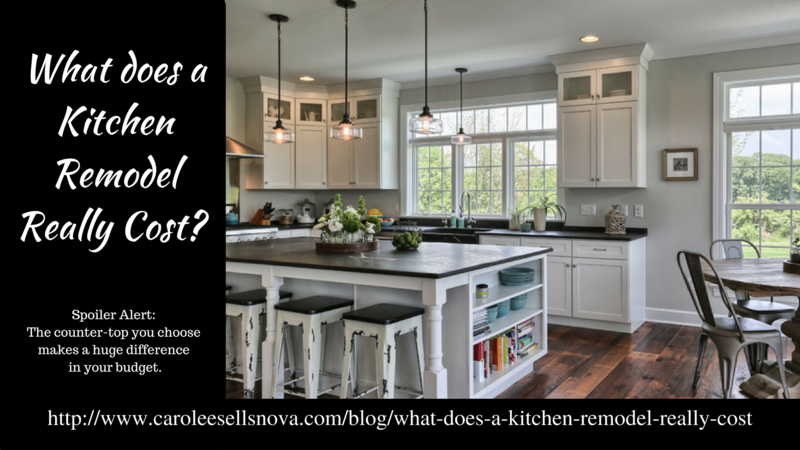 Lighting makes a huge difference, too: Recessed lights cost about $150 a piece to install, and over-the-island pendants start around $150. And faucets are a final punctuation: They start at $200 but can cost as much as $1,000.